BILLINGS, Mont. 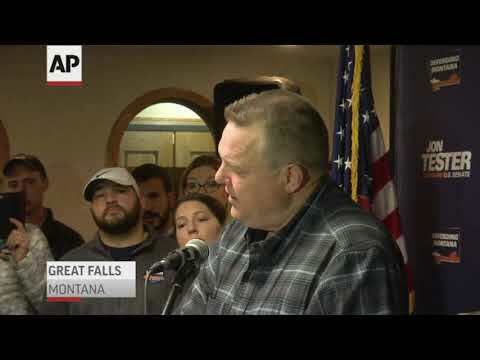 (AP) — Only U.S. Sen. Jon Tester of Montana survived President Donald Trump’s aggressive campaign to topple Democratic senators from Republican-leaning states who voted against his Supreme Court picks. Conservative groups followed the White House’s lead by pouring tens of millions of dollars into ad campaigns against the Democratic senators. Tester earned particular ire for his central role in derailing Trump’s pick for Veteran Affairs secretary, Ronny Jackson, by airing misconduct allegations against the White House doctor. On Tester’s turf, the president’s attention was enough to raise Montana state Auditor Matt Rosendale from political obscurity to a contender in a race that set a state record for political spending. While other Democrats in states that Trump carried in 2016 went down Tuesday — Heidi Heitkamp in North Dakota, Claire McCaskill in Missouri and Joe Donnelly in Indiana — Tester’s victory helped blunt the GOP’s expansion of its majority in the Senate. Joe Manchin held on in West Virginia, but he backed the president’s court nominees. Tester fended off his opponent by combining his populist appeal as the Senate’s only farmer with a message heavy on health care and veterans’ issues. He targeted female voters with frequent references to the need to protect reproductive choice. Tester also reached out to young people who might be disaffected with Trump. Through it all, Tester avoided tangling directly with the president. He sought to defuse their feud by frequently citing veterans’ legislation that the Democrat sponsored and Trump signed. The conciliatory tone continued after the election results trickled in Wednesday, even as Democrats elsewhere appeared emboldened to take on Trump after their party captured a U.S. House majority. The White House campaign to take down Tester and install Rosendale also included multiple visits by Vice President Mike Pence and the president’s son. “In this case, the Tester brand was able to stave off the Trump brand,” said Jeremy Johnson, a political analyst at Carroll College in the state capital of Helena. The result, Johnson added, suggests Montana has managed to avoid at least some of the polarization Trump has stoked elsewhere in the country. Billings voter and Tester supporter Lynne Fitzgerald said the negative advertising in the Senate race was a turnoff. But she liked what Tester had to say, particularly about accepting people of different backgrounds in contrast to Trump’s propensity to stoke division. Tester, 62, is a farmer and a former music teacher from the small community of Big Sandy who won his seat in 2006 by defeating then-U.S. Sen. Conrad Burns. Six years later, Tester beat then-U.S. Rep. Denny Rehberg. In 2012 and again this year, Republicans tried to take down Tester with allegations he had become part of the same Washington establishment that he had pledged to challenge when he first ran. But an Associated Press survey said the topic foremost on voters’ minds this election season coincided with one of Tester’s main issues — health care. It was more prominent than two issues frequently touted by Trump, immigration and the economy. The survey also suggested that Tester’s efforts to reach out to women worked, with the Democrat holding a significant advantage among female voters compared with his rival. Rosendale won a four-way primary in June after the Republicans’ first choice to challenge Tester, Ryan Zinke, resigned his U.S. House seat to become Trump’s Interior Department secretary last year. Rosendale made his campaign about backing Trump, who won a landslide victory in Montana in 2016. He framed himself as a champion of the president’s agenda and Tester as selling out Montana’s interests for those of the Senate’s Democratic leaders. Rosendale conceded defeat and called to congratulate Tester soon after The Associated Press called the race Wednesday. “While we suffered a setback, our movement and our cause will continue to move forward,” he said in a statement.